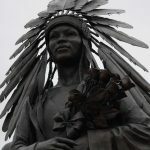 By Kerry DexterIn the center of a walk which crosses a university campus in the deep south, there is a statue of an African American woman holding a bouquet of roses and wearing a feathered head dress such as Indians of the western plains once wore. It will stop you in your tracks. What is she doing there? The campus in that of Florida State University, in Tallahassee, Florida. The woman in the statue is Doby Lee Flowers. She’s wearing that dramatic and, it might seem, unusual head dress because that is the head dress she wore when she was chosen as homecoming queen for the university in 1970. Flowers was the first African American to be so chosen. Was being named homecoming queen really that important? For a black woman to be so recognized on any campus in the United States in 1970, yes. It was a mark of both social and political shift. In 1970, the long road toward integration of the races in education and elsewhere in life which had begun a decade and half earlier was moving forward, but slowly. FSU had admitted its first black undergraduate student, Maxwell Courtney, in 1962. In 1965, Flowers’s older brother, Fred, became the first African American to be part of an official sports team representing the university. With her election as homecoming queen in 1970, Doby Lee Flowers added another chapter to the integration story, not only in Tallahassee, but across the country.Comment: Even with the explanation, I don't quite buy it. A statue for a homecoming queen? Does that mean every other black pioneer already has a statue? And what's the excuse for showing her in an Indian headdress? What does that have to do with her civil rights achievement? Wouldn't she be just as honored without the headdress? Why risk offending Indians for the sake of making the statue more "colorful"? I can just imagine what the statue committee thought. "This girl is a civil rights pioneer? She looks totally ordinary. "How can we make the statue more exciting? Can we give her a crown or something? "I know, let's put her in an Indian headdress! Who cares whether it's stereotypical or not? She's no different from our Chief Osceola mascot, who also looks stereotypical. Besides, she wore the headdress, so it's 'accurate' in that sense. "The important thing is, people will come and gawk at the girl's statue now. Even if they don't know or care who she is, they'll be impressed. 'Look, a funny Indian girl!' they'll say. 'She must be a princess or something!'" For more on the Seminoles and their mascot, see Chief Osceola Is "Respectful"? and Seminole Spearchucker Is "Top Tradition." The statue is clearly depicting her as she appeared when she was crowned. Do you really want them to pretend they didn't put a plains headdress on her head? Shall we also pretend Wounded Knee never happened? Maybe we can all start denying the whole genocidal mindset of the 19th century too! I'm sure nothing but good can come from pretending THAT never happened. As misguided and ignorant as the misuse of headdresses are today, Drew barrymore included, I think the important thing here is to take the opportunity to educate about the origins of headdresses and their meaning(s) to the not so idiotic and more serious students. Headdresses and tipis are not from Monument Valley, or the desert, no matter how much you love John Wayne. They are a plains custom and not every plains tribe wore them.